We conduct workplace related and skill based classes in Content writing, Media literacy, Business writing, communication skills and Advance Tally Software. The courses are global in nature and highly applied (Practical). 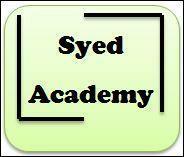 Syed Academy conducts classes in Communication Skills Training, Spoken English and Tally Software. It is located in Kilpauk, Chennai. It takes Regular Classes- at the Institute.